The importance of hose assembly and maintenance necessited the introduction of Training. 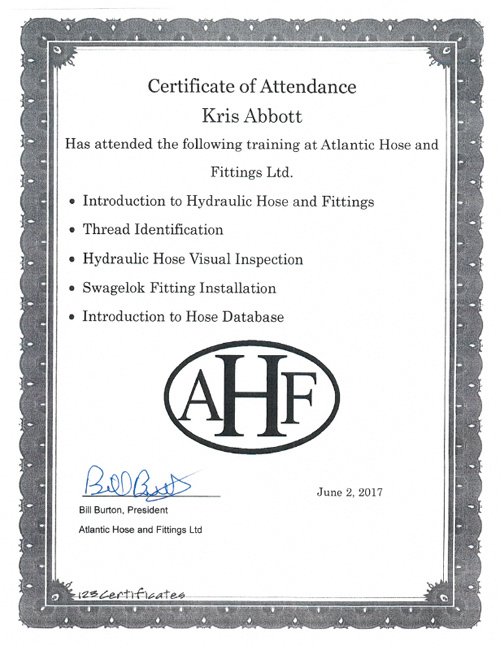 Atlantic Hose is proud to be the first to offer certifications in hose assembly. To find out more please contact us by phone or email to the right. There are many reasons a hose can fail, but often, the most common failures could have been avoided with proper precautions. At Atlantic Hose, we work closely with customers regarding hose maintenance and failures We know how to protect your hoses, keep your machinery running and reduce costly downtime. Some common reasons for hose failure. Afterall prevention through inspection plus maintenance is the best laid plan to keep your operation running smoothly.